Dyson was born in Cromer, Norfolk, one of three children. He was educated at Gresham’s School, an independent boarding school in Holt, Norfolk, from 1956 to 1965. In the late 1970s, Dyson had the idea of using cyclonic separation to create a vacuum cleaner that would not lose suction as it picked up dirt. He became frustrated with his Hoover Junior’s diminishing performance: the dust bag kept becoming clogged with loads of dust thus reducing suction. The cyclone idea came from a sawmill that used cyclone technology. 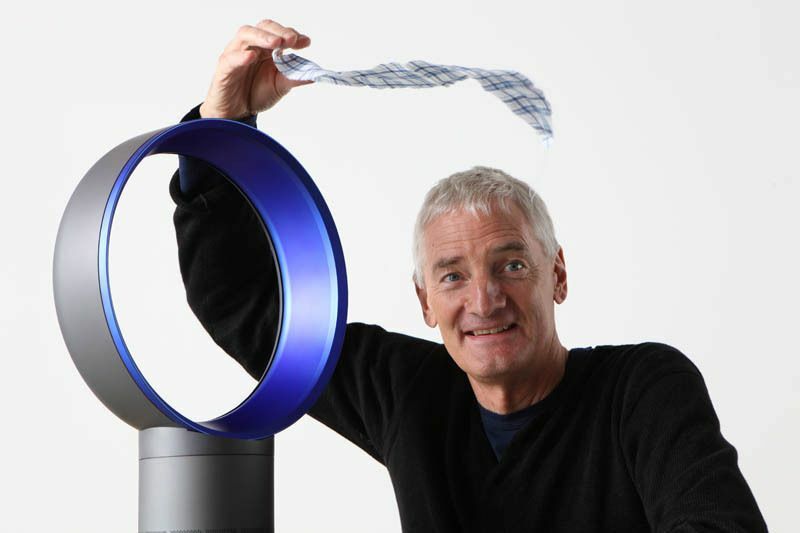 Partly supported by his wife’s salary as an art teacher, and after five years and many prototypes, Dyson launched the “G-Force” cleaner in 1983. However, no manufacturer or distributor would handle his product in the UK, as it would disturb the valuable market for replacement dust bags, so Dyson launched it in Japan through catalogue sales. Manufactured in bright pink, the G-Force sold for the equivalent of £2,000. It won the 1991 International Design Fair Prize in Japan. He obtained his first US patent on the idea in 1986. Dyson’s latest invention, the Clean Ring. Cleans your snotty hanky in seconds. It is also self cleaning as nobody wants a dirty ring. Dyson’s breakthrough in the UK market came more than ten years after the initial idea, through a TV advertising campaign in which it was emphasised that, unlike most of its rivals, the Dyson vacuum did not require the continuing purchase of replacement bags. At that time, the UK market for disposable cleaner bags was £100 million. The slogan “say goodbye to the bag” proved more attractive to the buying public than a previous emphasis on the suction efficiency that its technology delivers. Ironically, the previous step change in domestic vacuum cleaner design had been the introduction of the disposable bag – users being prepared to pay extra for the convenience. The Dyson Dual Cyclone became the fastest-selling vacuum cleaner ever made in the UK, and outsold those of some of the companies that rejected his idea, becoming one of the most popular brands in the UK.